It’s an exciting time of year in SU land – the Annual Catalogue and Occasions Catalogue finish at the end of this month and a new catalogue starts next month, full of so many lovely new products! I am sad to say quite a number of my stamp sets ended up on the retirement list this time around. Only about a third of my current collection is carrying over to the new catalogue. But that’s not to say they will be leaving my stamp set collection any time soon. 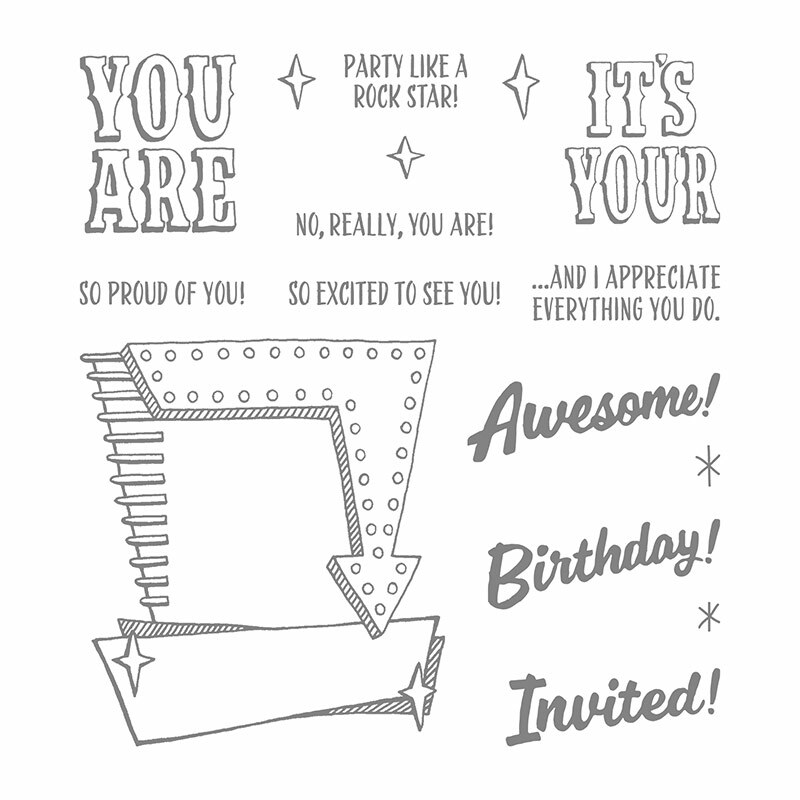 So, without further ado, here is the stamp set I’ve used for my project tonight – Marquee Messages. This set caught my eye when it was first released, but I must confess I’ve only used it twice before. I love the combination of pink and green (I used them as my wedding colours!) And this layout is one I’ve seen a number of times in SU catalogues. I could not get a crisp black ink image with archival ink. If I stamped it nicely, I managed to smudge it after! So I tried Versamark and black embossing powder. I got a couple of images that turned out okay but then when I started colouring I found one part that wasn’t set and then on the next one the embossing came off when I coloured over it with watercolour pencils! Aagghh! So back to one of the archival ink stamped images for my colouring. The intense colour is from markers and the lighter colour is from water colour pencil and blender pen. My phone battery went flat just as I took my first photo, so I had to take photos with my iPad, which are a bit blurry. The saga continued when I couldn’t log in to WordPress to upload my photos. But! I’ve written my post and shared my card with you, even if it is blurry stamping in a blurry photo. Do you have days where things just do not go how you planned? Have you got a favourite colour combination and card layout? Which retiring product will you miss the most? Thanks for visiting! Next is Siobhan with her gorgeous creations. I’m glad you overcame all that drama to share this because it’s fabulous. I love the colouring and the effect of the glue is gorgeous. I keep meaning to try that out. I love this card, the colours and everything 😊 It looks fantastic to me. I haven’t got that stamp set but I have seen it shine on its own right with different designs.